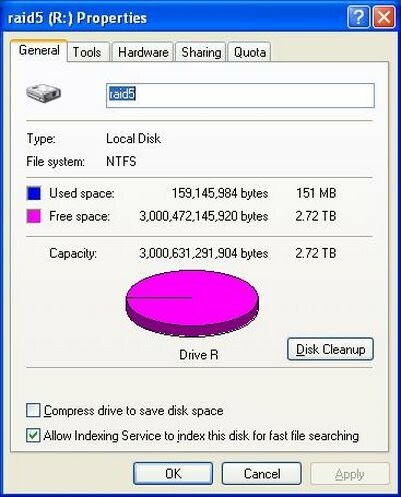 Yes, that is 7 x 500GB totalling 3500GB, and with redundant drive, you get 3,000,000,000,000 Bytes free! If you use Mpeg-4 H.264 video compression, this drive may store 3,000 movies or almost 6000 hours of DVD quality video. Now, if one of the drives fails, the data is still there. All you need to do is (hot)swap in a replacement drive, and it will automatically rebuild, with no downtime. II moved all but one of the disks to another PC with a different SATA controller, and added a 500GB PATA drive from a different manufacturer. Windows allowed for easy configuration, and used the new PATA drive to rebulid the redundant array. With dedicated hardware RAID-5 you may see 30% better performance, but if you have failures in the drive controller you are typically screwed. You have to be able to purchase the exact same controller since the drives are custom formatted. Also, you will not be able to swap between SATA and PATA or eSATA. One advice when you have a big disk: Back it up. You probably have an eSATA port on the back of it, where you can plug in an external 500GB drive (Or you can use a slower USB port) Talk your friends into being your backup. They will probably happily come by with a 500GB drive and "back up" your movies, and you may do the same for them. This way you have both RAID-5 reliability and off-site backup of your stuff. Bottom line is that Software RAID-5 on windows XP is easy, reliable, portable, and flexible. This is probable important to you as your video collection grows, and you want to keep it for many years without worrying too much that a single disk failure will ruin your library.